Will someone please lock this piece of crap? Many of us would like to see the unpublished footage either as extras or incorporated into a revised cut of the film. Some may even like it if the film was remade with possibly Russell Crowe as Max, Sean Penn as Noodles, Jennifer Connelly as the older Deborah and directed by De Niro or Eastwood, with all the implausible bits made plausible. However much we may want to see the unpublished footage, regrettably it's not going to happen by our just talking about it. Cool it please,afterall you don't have to look at this thread even if its not really progressing anywhere quickly. Derbent,do you have more details of the extra footage on the French video tape? If Leone had to cut 50 minutes that he felt were IMPORTANT then wouldn't the footage being put back in be Leone's original vision? It has been reported in other threads that, at the end of filming, Leone had 10 hours worth of footage. With his editor, Nino Baragli, Leone trimmed this down to about 6 hours, and wanted to release the film in two three-hour parts. 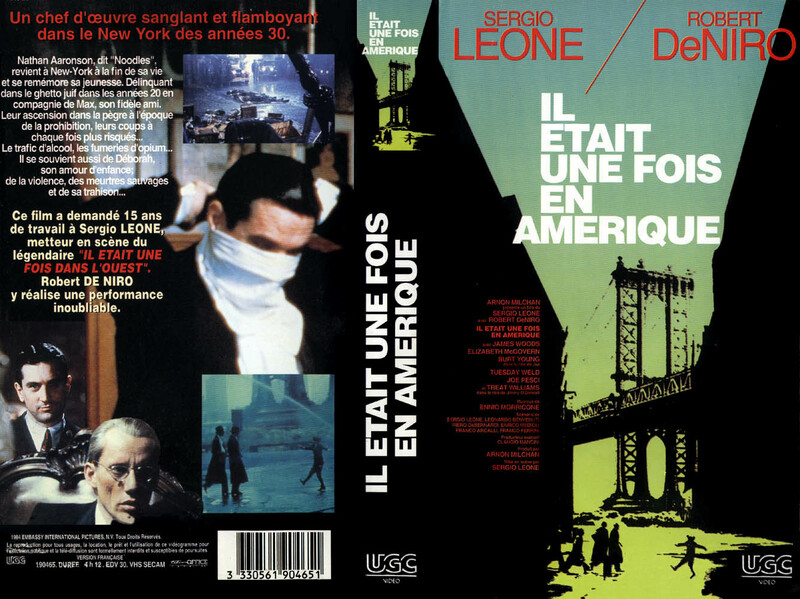 The producers refused (partly due to the commercial failure of Bertolucci's two-part Novecento) and Leone was forced to further shorten the length of his film, resulting in a completed (i.e. scored, dubbed, edited, etc.) film of 229 minutes. Leone has said that ideally, he would have liked the film to be "between four hours ten minutes and four hours twenty-five minutes" (250 minutes to 265 minutes), and that such a cut would mainly have served to restore scenes developing Noodles' relationships with women. Many people have said that Leone had a vision of the film from the start; he could act out every part and his vision did not change. The documents I have read and commonsense contradict this. Various parts of the film differ from the screenplay. The actors, writers and even Grey will had had an input and unlike some directors, Leone would listen to the views of others. Some scenes resembled scenes in other movies and had to be altered. Money and time prohibited the filming of other scenes. I would love to see the deleted scenes either on their own, integrated into a new cut or even a complete remake. However some of the unpublished scenes are pointless - Eve dying from a drug overdose/broken heart etc. 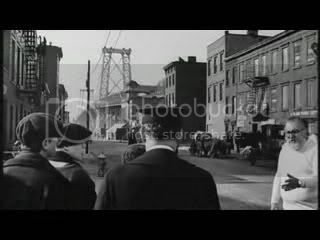 Others would no doubt make the film less puzzling or more appealing to a new viewer - the arrest of Bugsy, scenes with Jimmy, Police Chief Aiello, Eve etc but it is doubtful whether the benefit can be justified by the cost. In any event it's a pretty good film just the way it is. One option would be to include with new DVDs a booklet, describing the history of the film and giving various explanations for some of the scenes which new viewers may find confusing. Plus, if possible, some of the unpublished footage in its raw form - who needs dialogue anyway? Been catching up lately - A Bronx Tale and Mean Streets scheduled for this weekend, 1900 in 2 weeks' time, followed by Frayling's book and revisiting the fistful of dollars trilogy . Many thanks for these links Derbent. The Williamsburg bridge is in the background of one of the links. I love that picture! The black and white looks great. I remember talk on the old board that there was a cut scene shown on Italian TV, that some had on tape. It showed McGovern acting as Cleopatra on stage while Noodles watching. Has anyone found this on the net? YouTube or somewhere else? Would love to get my hands on this, preferably a high quality version, but even a low quality YouTube video would be great. Thanks! Nice one. Anything from this film is of great interest to me. Thank you rot66 - line dancing to Modern Talking (From Coast To Coast and Heart Of An Angel) is very popular at a nearby venue but it's the first time I've ever seen this. Leone's film certainly makes a lasting impression worldwide. I dont know i mean i really really wish it was true but Leone Commentary? Many thanks Derbent. We can only hope that the anniversary is marked with something special and I shall certainly be at the front of the queue if anything is released.